Despite his religious awakening, Randall continued to work in Marblehead and Salem, Massachusetts during 1871, returning to his native New Castle in the fall of that year to set up shop as a sailmaker in October of that year. 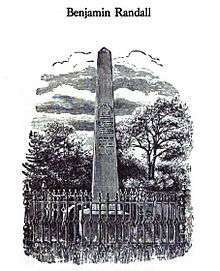 In November 1871 he married Joanna Oram (born 1748) of Kittery, Maine, the daughter of another sea captain. 1 2 Frederick Levi Wiley, Life and Influence of the Rev. 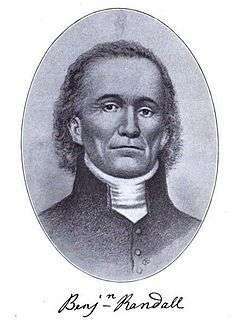 Benjamin Randall: Founder of the Free Baptist Denomination. Philadelphia: American Baptist Publication Society, 1915; pg. 5. ↑ Wiley, Life and Influence of the Rev. Benjamin Randall, pg. 7. ↑ Wiley, Life and Influence of the Rev. Benjamin Randall, pg. 8. ↑ Wiley, Life and Influence of the Rev. Benjamin Randall, pg. 9. ↑ Wiley, Life and Influence of the Rev. Benjamin Randall, pg. 10. ↑ Wiley, Life and Influence of the Rev. Benjamin Randall, pg. 12. ↑ Wiley, Life and Influence of the Rev. Benjamin Randall, pg. 14. ↑ Wiley, Life and Influence of the Rev. Benjamin Randall, pg. 16. ↑ Wiley, Life and Influence of the Rev. Benjamin Randall, pg. 23. ↑ Wiley, Life and Influence of the Rev. Benjamin Randall, pg. 24. ↑ Wiley, Life and Influence of the Rev. Benjamin Randall, pg. 26. ↑ Wiley, Life and Influence of the Rev. Benjamin Randall, pg. 27. ↑ Wiley, Life and Influence of the Rev. Benjamin Randall, pg. 29. ↑ Wiley, Life and Influence of the Rev. Benjamin Randall, pp. 30-31. ↑ Wiley, Life and Influence of the Rev. Benjamin Randall, pg. 31. ↑ Wiley, Life and Influence of the Rev. Benjamin Randall, pp. 31-32. 1 2 Wiley, Life and Influence of the Rev. Benjamin Randall, pg. 33. ↑ Wiley, Life and Influence of the Rev. Benjamin Randall, pg. 34. ↑ Wiley, Life and Influence of the Rev. Benjamin Randall, pg. 35. ↑ Wiley, Life and Influence of the Rev. Benjamin Randall, pg. 37. ↑ Wiley, Life and Influence of the Rev. Benjamin Randall, pg. 43. ↑ Wiley, Life and Influence of the Rev. Benjamin Randall, pg. 46. 1 2 Wiley, Life and Influence of the Rev. Benjamin Randall, pg. 49. ↑ Wiley, Life and Influence of the Rev. Benjamin Randall, pp. 49-50. ↑ Wiley, Life and Influence of the Rev. Benjamin Randall, pg. 57. ↑ Wiley, Life and Influence of the Rev. Benjamin Randall, pp. 59-60. ↑ Wiley, Life and Influence of the Rev. Benjamin Randall, pg. 60. ↑ Wiley, Life and Influence of the Rev. Benjamin Randall, pg. 62. ↑ Wiley, Life and Influence of the Rev. Benjamin Randall, pg. 63. ↑ Wiley, Life and Influence of the Rev. Benjamin Randall, pg. 65. ↑ Wiley, Life and Influence of the Rev. Benjamin Randall, pg. 75. ↑ Wiley, Life and Influence of the Rev. Benjamin Randall, pg. 79. ↑ Wiley, Life and Influence of the Rev. Benjamin Randall, pg. 81. ↑ Wiley, Life and Influence of the Rev. Benjamin Randall, pp. 82-83. ↑ Rupp, An Original History of the Religious Denominations at Present Existing in the United States, Containing Authentic Accounts of their Rise, Progress, Statistics, and Doctrines... Philadelphia: J.Y. Humphreys, 1844; pg. 59. ↑ Rupp, An Original History of the Religious Denominations at Present Existing in the United States, pp. 59-60. 1 2 Rupp, An Original History of the Religious Denominations at Present Existing in the United States, pg. 60.